Joe Moran of 1 Degree Consulting talks about the importance of a Soil Management Plan on this week’s episode of Joe Knows. 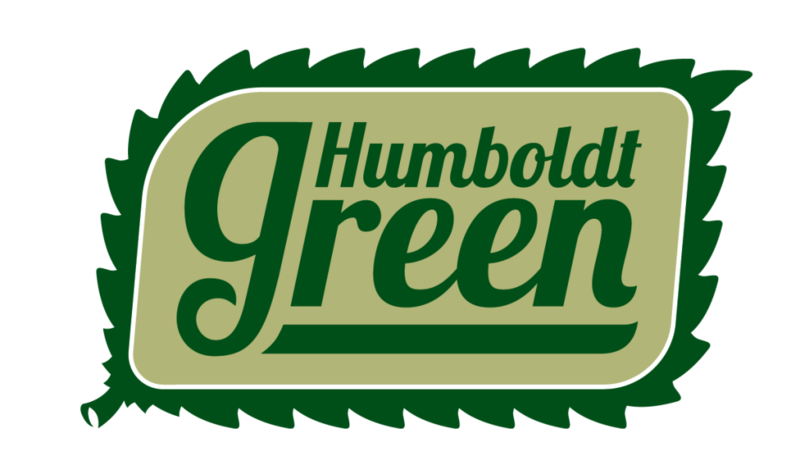 Tune into the Humboldt Green YouTube channel each week for industry news and information. Joe knows soil! Managing your soil is a huge component of growing cannabis. It’s important to test your soil and water, not just for a healthy yield, but you want to be able to past testing and get your product into the hands of consumers. 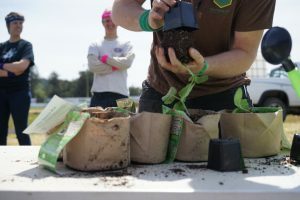 There are two soil models in cannabis farming, managing native soils and importing soil to your farm. There are some negatives and benefits for each model. When you import soil there are a lot of costs you have to consider. The purchase costs, freight, delivery, soil storage and above ground irrigation. The positives are that you don’t need a huge nutrient regime because the soil comes loaded with food. Water storage, diversion and reporting of water usage are some of the bigger elements to importing soil. Above ground containers can also use a lot of water. Benefits of using native soil and having plants in the ground is that you save on purchasing and labor costs, plus there’s already a water source in the ground. The water retention value for native soil is greater than farming in a container. The native soil already has minerals and nutrients, but the important thing is that you want to get it tested because you might have deficiencies or too much of one property. Farmers can consider both models, but you need a soil management program for farm to be successful. If you’re going after your County permit, you need an Operating Plan, Soil Management Plan and a Site Management Plan for your waterboard enrollment. The team at 1 Degree Consulting can help you write the plans that are needed for compliancy. Seasonal year-round planning is important when it comes to soil management, whether you’re doing it during the growing season or during the wintertime. The Soil Scientists at Dirty Business Soil inside of Northcoast Horticulture Supply, can test your soil, water and plant tissue and create a custom Nutrient Management Plan (NMP) based on analytical results. NHS can then create a custom soil and amendment blend based on your NMP and offer Farm-Direct pricing on all of your supply needs. 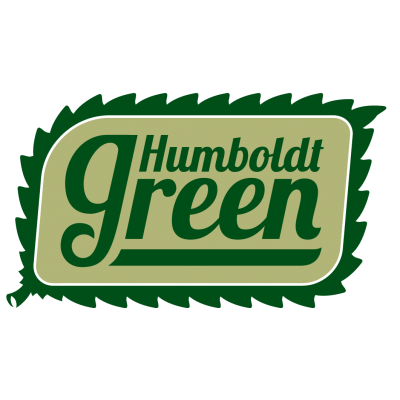 Steve Gieder, CEO of Humboldt Green announced on February 27th that he would be taking Humboldt Green Holdings public on the Canadian Stock Exchange. In a Skype interview with Steve Darling, Senior Broadcast Journalist of Proactive Investors, Gieder discusses what lies ahead for the family of businesses Northcoast Horticulture Supply, Dirty Business Soil Consulting & Analysis, Humboldt Ag Supply and 1 Degree Consulting. 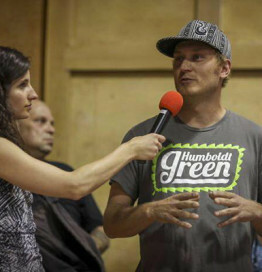 Host Brian Curtis of the KHSU News Magazine Show interviewed Natalynne Delapp, Operations Director for Humboldt County Growers Alliance back in late December. 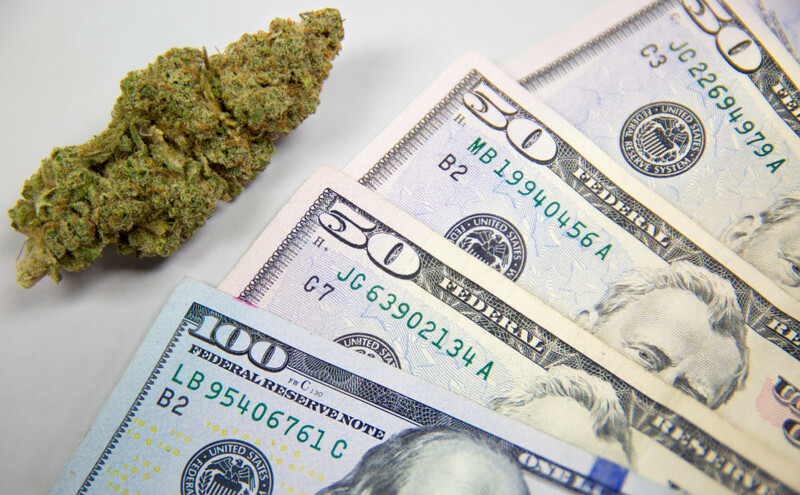 They discussed the challenges and opportunities posed by recreational cannabis in California. Natalynne mentioned working with Humboldt Green back in 2016 to put together the Compliance Handbook Cannabis Farmer’s Workshop Series. There were over 6,000 Compliance Handbooks distributed to Farmers throughout the Emerald Triangle. The handbook helped Farmers understand how to prepare for the State Water Board order, how to follow county ordinance and also how to get enrolled under fish and wildlife. The Compliance Handbook has been instrumental in getting cannabis Farmers on the right path by using best management practices and complying with existing regulatory programs. You can listen to the in-depth interview online at KHSU’s website. Wildfires in Northern California have incinerated homes, structures, vineyards and cannabis farms. Those affected by this devestation need help and support from fellow cannabis community members. Humboldt Green received the following email from Jessica Lilga of Alta Supply explaining how the cannabis community can help during these difficult times. I live on the edge of coffee park neighborhood of Santa Rosa. Awakened Sunday night by the sound of propane tanks exploding as fire rapidly swept through, we left the house immediately.. On the way to a friends in Sebastopol, streets were flooded with frantic people all barely escaping. Once arrived and looking for information, ash and embers rained down thick. We turned on sprinklers and sprayed down the house. Soon, the winds shifted and we were fine. We put out the word the Sebastopol house was safe and friends who did loose houses came. We used this house to offer comfort to as many as we could. We are filled with gratitude knowing how lucky we all are. Its just stuff, we have each other and good insurance. In time, everything will work out. As of now, I hear my house is fine. Our cannabis community is not so lucky and needs our help. Reports are rolling in and they are not good. Cell service and power lost, so many people couldn’t reach out for help. Many farmers have lost homes, greenhouses, animals and tragically enough, family members. Without insurance on crops, these families have lost their livelihoods. With fires still ranging strong, this destruction is not over and many are scrambling, fire at the edge of their properties, frantically harvesting to save what is remaining. Heavy smoke damaging crops that do remain, so many farmers affected in so many ways… This will be a challenging season for thousands of cultivators. It was already a make or break year for so many. The challenges of regulation and risk reduction motivated many farmers to give this year everything they have and really maximize the opportunity. Our humanity calls us to ACT. What I personally can contribute is the statewide network of dispensaries Alta Supply works with. Many farmers want to help and have no financial means at this time. Alta Supply can accept donations from Cultivators who have not been affected, anyone who can spare a unit or two to help a fellow farmer in need. All funds will be donated to fellow farmers who lost their livelihoods. Share this to your social media and help get the word out. 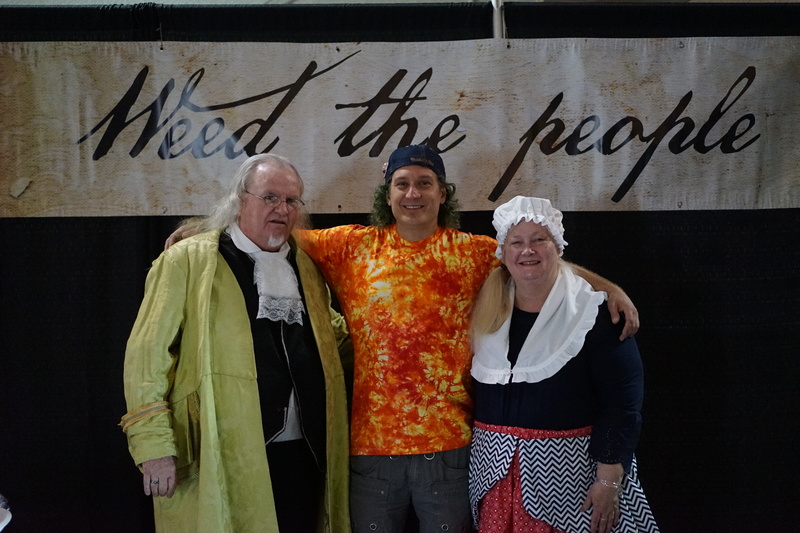 Cultivators willing to donate flower. Full or half pound units. Farm to Farm direct support. For giving farms, please list farm name, contact info, varietal/strain name and lineage, total weight donated. We will connect you directly with the farmer you will be supporting unless you prefer to remain anonymous. Anyone who can serve as a Regional Drop off depot for cultivators who have flower to donate. Courier Services. We know how challenging it is to get off the hill, so those willing to arrange a pick up from farm would be useful. We will also be needing assistance delivering to our hub in Oakland from drop off depots. Ask a fellow lab if they are willing to do testing for donated flower. SC Labs has kindly offered free testing services for all donated flowers. Alta Supply will create a special menu online where donated flower will be available for dispensaries all throughout the state. A special link will be sent to every shop statewide interested in participating. Please help us find farmers who lost both home and farm to support, please reach out with a list of names of those who really need it the most. John@foremanfarms.com has a freezer truck and a place down south to process, contact for details. If you have resources to help farmers in harvest to save crops, please reach out. Here are a few we know of so far: (Please donate directly if possible). Monica and Razor lost their home and farm in Santa Rosa. Currently living out of car with their 2 dogs they were blessed to save. Razor is suffering from extreme smoke inhalation and needs a comfortable place to stay while in recovery. Paul has the most harrowing story so far. He lost everything, farm and house. His daughters mom lost everything too. He saved the neighbors, mom and daughter, tho they lost their son. Ashley on instagram @FrostFlowerfarms707 Shes an amazing cultivator with an enduring spirit. Part of the Mendo Gen Group. Shelby is a dear personal friend of mine who lost everything. For those able to provide cash donations, CalGrowers Wildfire Fund is a fantastic choice. Any other way we can collaborate to offer support, please reach out, we are open to suggestions. We have no idea how many people are truly affected at this point. There are some serious tragedies and some close calls, many gardeners are frantically harvesting now and could use a safe processing/curing room. Please let us know if there are other ways to contribute and we are happy to make connections. If you have supplies and items that you would like to donate to fire victims, all four of the Northcoast Horticulture Supply stores and Fortuna Feed are drop-off locations for donations. We have volunteers driving items down to Mendocino, Sonoma and Napa county. Thank you for your support! 1 Degree Consulting empowered by Humboldt Green is currently on the road visiting cannabis farms all over Northern California for the Candor Project creating Humboldt County’s first cannabis herbarium. Ken Hamik, part of Humboldt Green’s cannabis brain trust was traveling with the team and received a phone call from Gretchen Gailey at New Frontier Data. We’ve been working closely with New Frontier Data on the Humboldt Grower Survery. Gretchen had mentioned to Ken that their source at USA Today was looking to write a story about Sonoma cannabis farmers affected by the fires. 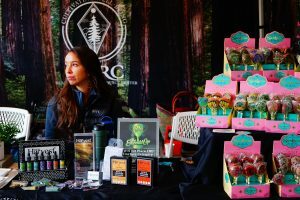 Ken offered to put them in touch with Jessica Lilga of Alta Supply, a statewide wholesale cannabis distribution company since she is a boots on the ground source for cannabis farming in Mendocino and Sonoma. 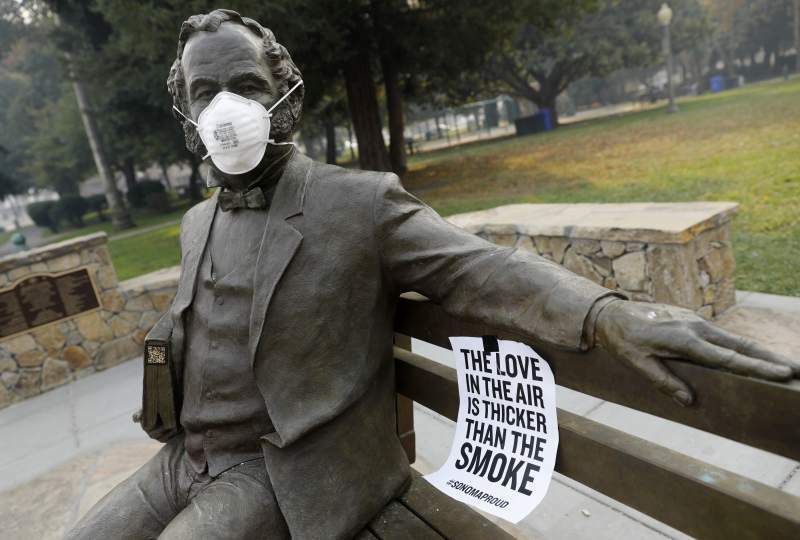 Thanks to Ken’s networking, USA Today has published a national story with Jessica’s quotes about how the California fire’s are affecting the cannabis industry. Read USA Today’s article California’s Marijuana Farms May Go Up In Smoke. 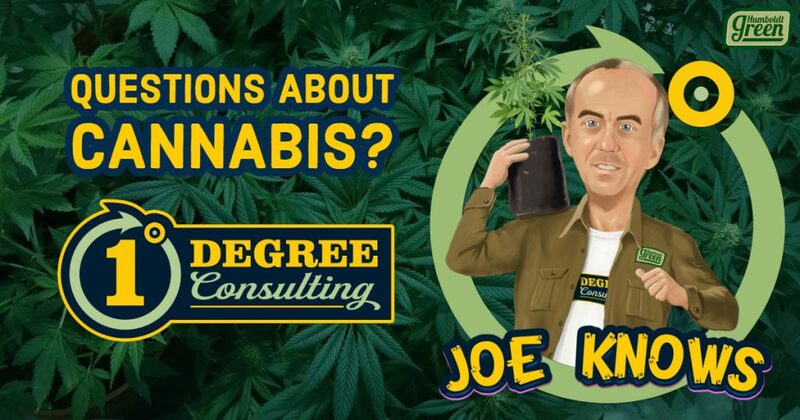 1 Degree Consulting and Humboldt Green keeping the cannabis community connected! 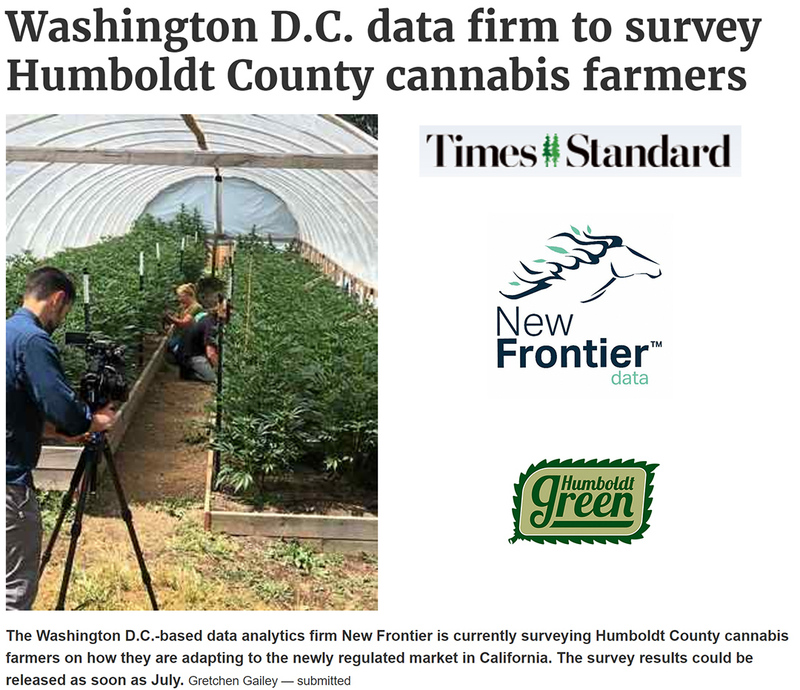 Our local newspaper, the Times-Standard, has an article about New Frontier Data partnering with us here at Humboldt Green to gather farmer data. 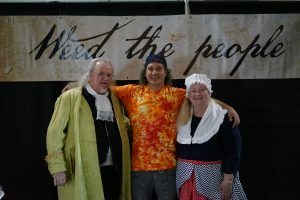 The Washington, D.C., marijuana data analytics firm New Frontier is conducting a novel survey of Humboldt County’s cannabis farmers and how they are adapting to the advent of legalization.